Strange Music has always made it a point to showcase local talent during nationwide tours, and the Something Else Tour is no different. With the upcoming show in Joilet, Illinois coming up on October 15 at MoJoes, we got ahold of the opening acts Haze and 2nSane and asked them what they thought about the opportunity to open on one of Tech N9ne’s biggest tours. Tell us about your music and how you’ve come up in your area. HaZe: I would definitely say things have taken a turn for the better since i’ve joined with the UG team. Being a female emcee in underground music has its pros, but I definitely got a lot of doubt from male artists when I first hit the scene due to my gender. Recently though, I get more support than I could ever ask for. I feel my area shows me a lot of love and I can only hope to keep the bar high and continue to make music my fans love. Pazzo (2nSane): My music has always been based on real life experiences I’ve had. I like to make that genuine connection with the listener. I was influenced by Chicago names like Triple Darkness, Psychodrama and Twista as well as T-Rock, Poetic Hustlaz, Bone Thugs and of course Tech. The energy behind the lyrics has always captivated me and I guess that’s why I try to connect through my music the way I do you can feel the emotion behind it. I’ve been in the Chicago scene for over ten years and been a promoter going on four years with our independent promotion company UG Promotions, which has to be the one of the ways we’ve been able to come up in Chicago the way we have. Where most tend to just focus on themselves we’ve always been about networking and bringing the independent scene to life by creating a strong foundation of artists. For the last four years we’ve been nonstop from performing and putting together events with other local groups in the area. I think one of the biggest turning points was when we were noticed by Chicago legends and given the stamp of approval as a CWAL Mob Affiliate. Which is a group made up of Dawreck, E-Dub, Dutch and Savo; who are signed with Chicago super producer Legendary Traxster’s label Traxster Inc.Think that was the moment in which all the work we’ve put in was validated and we gained respect from the Chicago scene. What is it about the Chicagoland area that will make this particular date of the Something Else Tour a must-see? HaZe: The Strange fans in this area are off the chain. The amount of support and backing we have for anyone on Strange Music is something you have to see for yourself. 2nSane: I think the venue this time will make a difference as it’s smaller than the usual House Of Blues location. MoJoes brings a more intimate vibe this time around for their Chicagoland date. I’m confident the older Tech fans will vibe it as its almost reminiscent of the Pearl Room days in Mokena, while the new Strange fans will get an opportunity to see them perform more up close and personal than before. Do you think there’s something about fans in IL that sets them apart from the rest of the country? It’s all about the love. Most of these fans have been listening to Tech and all the other Strange Music artists since they were pre-teens. Here in Illinois, you will find dedicated followers who genuinely appreciate the love Strange Music gives to the fans and we refuse to miss a show! What can fans expect from your performance on this night? HaZe: I sing as well as rap, which I feel can give a bit of versatility to my performance. There is nothing I love more than being on stage in front of people who appreciate the music I make. I will most certainly be bringing my A-game on the stage and I’m sure Pazzo and Bobe Blaze will do the same. 2nSane: From us you can expect a high energy performance from myself (Pazzo) and DJ Bobe Blaze mixing it up while keeping up the momentum hyping from behind the tables. We definitely will be bringing it this night, as we aim to connect with people and make new fans. We hope that those who dig us will stop by our merch booth, as we are always down to talk and take pictures. What does it mean, as an independent artist, to be able to be a part of a show like this? Honestly, If you would have told us five years ago that we would be blessed with the opportunity to share the stage with anyone from Strange Music, we probably would have laughed. This is what we work for day in and day out, every small show in a ran down bar with only ten people in it, every hour of writing and recording, all the struggle that independent underground artists face…it’s all worth it once you’re able to perform on the same stage as your idols. 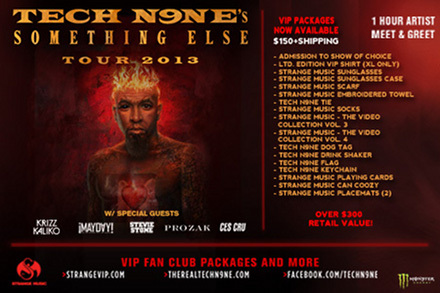 FOR THE SOMETHING ELSE TOUR 2013!